Miss our last edition? Read it here» Email not displaying correctly? View it in your browser. 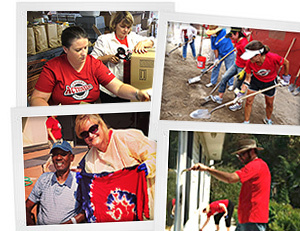 To celebrate our 40th Anniversary, rather than throw a big bash, we embraced our mission of Inspiring Actions That Matter™ by closing our offices and performing a day of service. Crosby "Actioneers" donated more than 360 hours of community service at four different charities and nonprofits. A dirty, sweaty and very satisfied group gathered afterwards to crack crabs and share stories from a day of giving back to the community that has given so much to us. In the last four decades, Crosby has grown from a 2-person PR agency to a top-ranked integrated communications agency with national clients. Our new timeline takes you through some of the pivotal moments along the way. Crosby's “Just As You Planned It” ad series for ACTS won in the Advertising Campaign category, Our ACTS Heron Point promo won in Direct Mail and an ACTS Manor House cover story won as an Editorial Article.